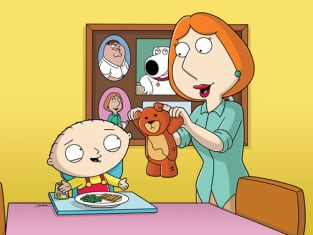 Stewie: (Comes into the bedroom) Lois! Lois! Lois! Lois! Lois! Lois! Mom! Mom! Mom! Mommy! Mommy! Mommy! Mama! Mama! Mama! Ma! Ma! Ma! Ma! Mum! Mum! Mum! Mum! Mummy! Mummy! Mumma! Mumma! Mumma! Family Guy Season 5 Episode 1: "Stewie Loves Lois"
Peter: No it's not okay, you don't know what it's like. Cleavland: You're wrong. I too have felt the cold finger of injustice on my insidey parts. Peter: He did it to you too? Quagmire: I have something to say. Dr. Hartman violated me as well. I only went in there for a physical slice guinea pig removal, but I turned out to be the guinea pig. With sexual experimentation. Joe: You guys are a bunch of queers. (Joe rolls away, but then comes back) And so am I. Oh god, it was horrible. I scrubbed and I scrubbed, but damn it, they don't make water hot enough.